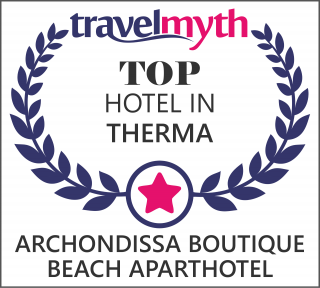 Located along the popular beach of Therma in Samothraki, Archodissa Beach Hotel features well tended gardens with BBQ facilities. Guests enjoy free beach beds on the beach, only 20 m from the hotel. Archodissa Beach guest rooms have private balconies with scenic area views. They all come with a kitchenette and fridge, and each one is further equipped with air conditioning and heating. Guests can prepare their own meals, or take a breakfast served by the Archodissa Hotel. Free Wi-Fi is offered in public hotel areas. ” The drums beat late into the night and oil torches flare at one of Samothrace’s many beach parties. Eyes closed, the smell of bonfires and tannic red wine transport you back to when life was dictated by the Temple of the Winged Nike, now a crumbling ruin. Its many repeat visitors love the unaffected nature of this north Aegean island. As well as a solid collection of hiking paths, a bucolic waterfall trail, and sweeping deserted beaches, the island’s hot springs and hillside thermal pools only add to the sense of otherworldliness. Stay The Archondissa Boutique Beach Aparthotel is secluded and just 20 metres from the beach. Each room has a sizeable balcony and terrace, studios from £40. Enjoy your vacation at Archondissa Boutique Beach Hotel. Excellent service, friendly faces, comfortable rooms, great decoration and unique natural environment. Archondissa Boutique Beach Hotel is open from April to October, offering unique hospitality.